Newcomer Kenneth Kraegel wryly draws from myth and legend to craft a daring and inventive tale to delight adventurers of all ages. Henry Alfred Grummorson is the great-great-great-great-great-greatgreat grandson of Arthur, King of Britain. On his sixth birthday, adorned with a helmet and sword, Henry goes in search of adventure. He challenges a fire-breathing dragon to a fight, but the dragon prefers a game of blowing smoke rings. A cyclops wants only to have a staring contest. Even the griffin will not engage in "a battle to the uttermost" of the type Henry desires. Desperate for a real battle, strength against strength, might against might, Henry seeks out the fearsome leviathan. Has he met his match at last — or might he find something he didn’t know he was looking for? Children bold and imaginative will relate to Henry’s quest — and smile at its unintended consequences. Kenneth Kraegel is a self-taught illustrator and writer. He is the recipient of a Society of Children’s Books Writers and Illustrators Tomie dePaola Honor Award and was a finalist in the third annual CJ Picture Book Award in Seoul, South Korea. He lives in Grand Rapids, Michigan. From a gifted new author-illustrator comes an original story about a very old hand: namely, Henry Alfred Grummorson, the great-great-great-great-great-great-great-grandson of King Arthur. On the day of his sixth birthday, Henry sets out for peril and conquest... Alas, all he finds are peaceable beasts. A Cyclops who prefers staring contests, a dragon who blows smoke rings, a griffin who plays chess — everyone’s actually pretty friendly. It’s still exciting. Debut author Kraegel proves he’s a talent to be reckoned with. He has a Monty Pythonesque sense of language, humor, pacing, and character—the text’s mixture of bombastic and deadpan deliveries makes for a stirring read-aloud. This fine sense of the epically absurd also animates Kraegel’s rococo watercolor and ink renderings: in his hands, a dragon’s scales coalesce into an intricate mosaic, a tree is a swirl of mazelike lines, and the sea becomes a tangled mass of blue ribbons. This is a good choice for reading aloud and for discussing such topics as friendship, aggression and the bravery it takes to change your mind. Though he doesn’t find the epic battles he imagined, Henry finds that friendship is something worth questing for. The text skips along like Henry’s donkey, bringing this irrepressible young boy to life. Kraegel’s winsome illustrations, full of expressive details and a timeless palette, recall the work of John Burningham. If there’s one thing that young boys probably can’t get enough of, it’s knights. 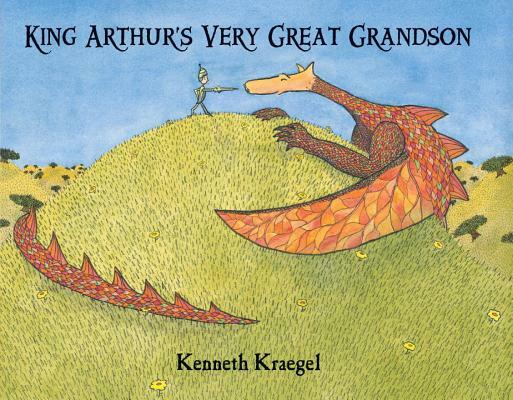 Kraegel introduces wee Henry, the many-times-great-grandson of King Arthur, who sets out for a rousing adventure on his sixth birthday. . . .Kraegel contrasts his simply drawn kid hero with a visual feast of wide, meticulously patterned landscapes. And thwarted expectations aside, the boy’s bombastic proclamations should inspire youngsters to great heights of stately derring-do against their own imaginary foes (and friends). There’s an appropriately folkloric pattern to Henry’s quest, and the surprising outcome of his search for a battle partner is humorously satisfying. Henry’s dashingly defiant, archaic dialogue is equally comical, making this a pleasure to read aloud. Kraegel’s line and watercolor illustrations feature a diminutive, helmet-clad Henry relentlessly pressing onward, sword extended, against the four not-so-fearsome creatures. There is a type of small child—and if you know one, you'll immediately understand the sort I mean—who will do just fine in the epoch of the iPod but who would have blossomed in the Age of Chivalry. KING ARTHUR'S VERY GREAT GRANDSON could have been dedicated to these valorous youngsters, for in the most ornate and charming way it acknowledges their natural impulses while gently frustrating them with an ending that reflects modern expectations. A charming debut picture book that puts a humorous twist on the classic quest tale. When does a book go from good to great? Just at the moment that the art and storyline meld and you realize you've got one of the best children's books of all time in your hands. Kenneth Kraegel has created just that combination.